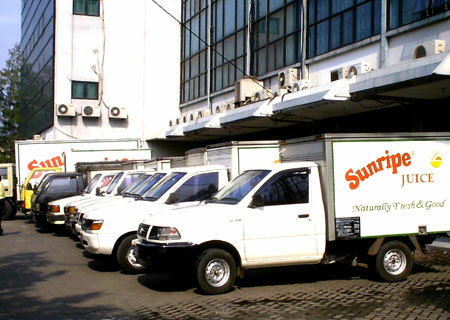 Established in 1986, PT Pancaran Mulia Sejati has been a trusted supplier of food and beverages for decades. Our main business is in manufacturing fruit juice from imported frozen juice concentrates and selected fresh tropical fruits. Beside ready-to-drink fruit juice, we also process juice concentrates of various strengths. Today, our array of quality products include marmalade, lollipop, refined liquid sugar and non-cholesterol cooking oil for the health-conscious. All of our products are made from the best ingredients under strict supervision and quality control. They have passed the proper tests from the Health Department of Indonesia (Departemen Kesehatan RI) and Indonesian Food and Drug Control Agency (Badan Pengawasan Obat dan Makanan RI). We supply our products not only to major supermarkets and retailers in Indonesia, but also to international hotels, restaurants, entertainment centres, airlines, ship chandlers, and foreign embassies. We have an efficient fleet of distribution teams and partners to deliver quality products to you wherever you are. For juice, marmalade and lollipop products, we can also formulate special flavors in unique packaging to your specific requirements. Click any links on the left for more information on our products. If you are interested in becoming one of our distributors or resellers, please take a look at our wholesale page.